It's glorious, beautiful, balmy Spring in this part of the world, but having a bunch of lovely foodie friends in the northern hemisphere, all I'm hearing lately is FALL PUMPKIN RECIPES! ...and apples. And cinnamon. And ginger. And pecans. And pretty much everything else in this delish little slice. There's a teensy tiny bit of maple syrup but most of the sweetness comes from the apple and pumpkin. And it tastes amazing, squishy and cool and not too sweet! Have you met Em from This Rawsome Vegan Life yet? 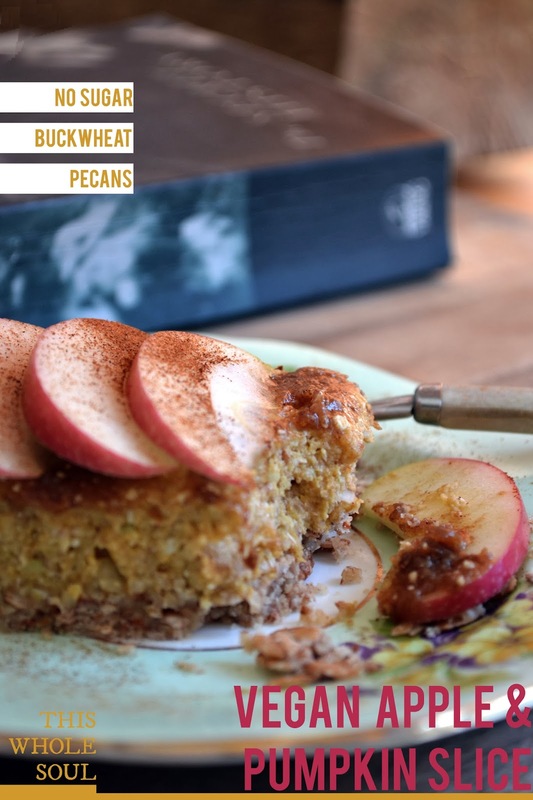 Head on over to her blog, you'll need the caramel paste from her raw vegan cinnamon roll recipe to top off this slice. Note to self: make cinnamon rolls again tomorrow. Mix the lot in a bowl till it comes together, then press into a loaf tin lined with baking paper. Refrigerate while you make the filling. Blend in a high speed blender till you have a thick sticky cheesecake like mixture. Spoon over the base. Cover with the topping and store in the fridge. This looks delish!! One question, do you spout your buckwheat groat before adding it, or do you add just the grains? can you sub oats for buckwheat groats. It isn't really a raw slice but it sounds lovely anyway. You may be able to do it raw by using uncooked pumpkin and dates instead of the maple if you really want to but for me either way is no problem.